The City of Fairfax Band Association is proud of its tradition of involving young musicians of Northern Virginia. Each year the Association offers a scholarship to an outstanding high school musician through the Young Artist Competition. 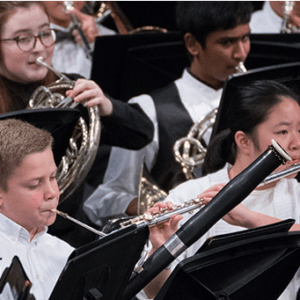 Several years ago, Northern Virginia Youth Winds was formed for high school and middle school musicians to supplement their school music education through participation within the larger music community. 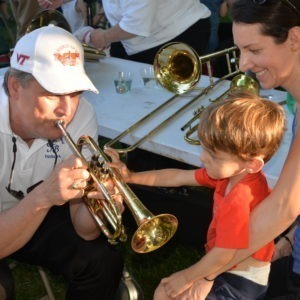 Every summer the Association hosts the Children’s Concert, featuring the instrument ‘petting zoo’ to introduce our youngest musicians to band instruments. Students are always admitted free to all our concerts. We are fortunate to have among our ranks many dedicated and talented music educators and students, and lots of very supportive parents, who value music education for children and teens. Music teachers on our Board and staff take time outside their busy jobs to write grant proposals to keep these programs going. Other adult musicians help raise additional need-based scholarship funds to sponsor students in the Northern Virginia Youth Winds. The musicians of the City of Fairfax Band and Main Street Community Band hope to see these young musicians return to us when their high school band days are behind them.